The draft Accountability Policy of the EBRD proposes a substantial and welcomed restructuring of the mechanism and improves on many of the issues of independence and predictability that hindered the PCM. 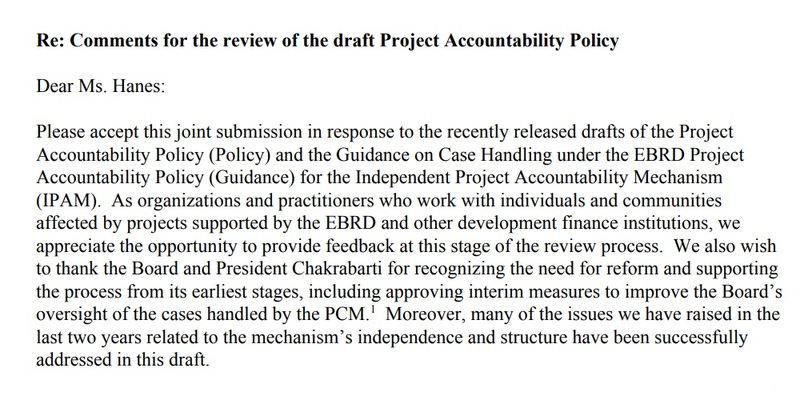 However, the draft Policy does not yet rectify all of the shortcomings of the EBRD’s accountability framework and, furthermore, introduces some rollbacks of the PCM’s Rules of Procedure that civil society organizations consider best practice. 25 civil society organisations call on the EBRD to protecting the safety of IPAM’s users, eliminating unreasonable barriers to access, ensuring accountability throughout the entire project cycle, effectively promoting awareness of the mechanism and effectuating accountability by authorizing IPAM to properly monitor cases.